The Boston Mineral Club meets monthly from September to June, on the first Tuesday, (second Tuesday if a three day holiday, such as Labor Day, precedes the first Tuesday). Other exceptions include the November meeting when it conflicts with national elections.The links at the end of this section will take you to descriptions of currently planned meetings and previous year's meetings. 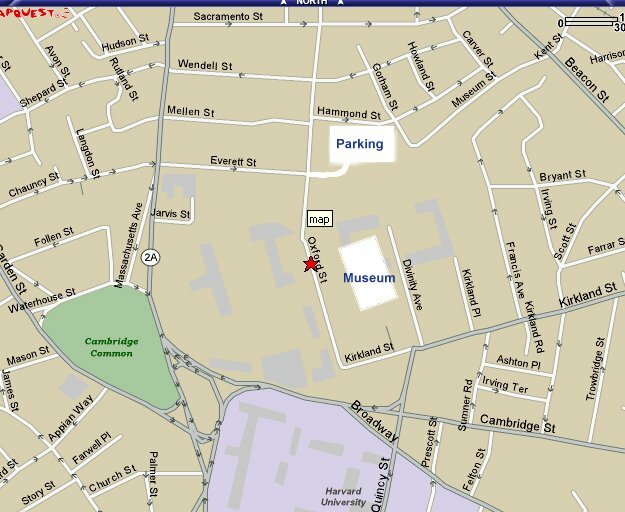 Meetings are held at 7:00 PM in Haller Hall, accessible via the 24 Oxford Street entrance to the Harvard Museum of Natural History building in Cambridge, MA﻿. If you are standing facing the main entrance to the Museum﻿, turn to your right. You will see another door at the top of some steps about 10 to 20 yards away. That is the entrance that leads to the large Geological Lecture Hall (on the right after you enter the building) and our meeting room, Haller Hall, is just down the hallway on the left. The mineral displays of the Harvard Mineralogical Museum are usually open to BMC members free of charge between 6:30 and 7:30 PM before each meeting. Members and visitors are encouraged to gather at 7:00 PM to socialize and set up displays of mineral specimens to complement the meeting topic. The meeting begins with a short business meeting at 7:30 PM, followed by the featured program of the evening. The program is usually an educational presentation on a mineralogical topic, supported by projected slides, exhibits, or videos. Speakers may be experts in the Earth Sciences academic community, professional mineralogists or geologists, or veteran collectors from outside or within the BMC. A specimen raffle concludes the evening. Special programs throughout the year include our annual Show and Tell night at the September meeting and the annual specimen competition at the November meeting. After parking in the garage, take the elevator to the ground floor, then exit the building through the glass doors up the steps to your right. It is a short walk from the garage to the museum. Be sure to take your parking ticket with you to get back into the garage after the meeting.